I ran across a video on Facebook one night while my wife was at the beach and realized that I must cook this. Anthony Bourdain did a video with Balvenie where he made steak au poivre over an open flame and was both immediately hungry and inspired. I didn’t have 7 hours in front of me to make the demi-glace in his recipe, so I made some modifications to the recipe, taking some liberties with his project. 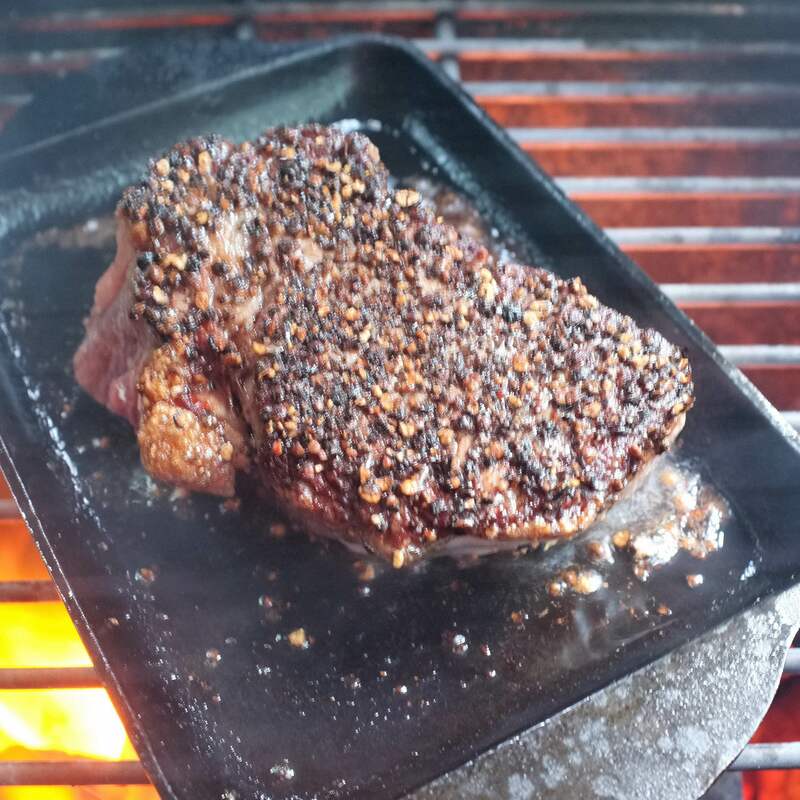 Steak au poivre is a French dish that consists of a steak, traditionally a filet mignon, coated with loosely cracked black peppercorns and then seared. 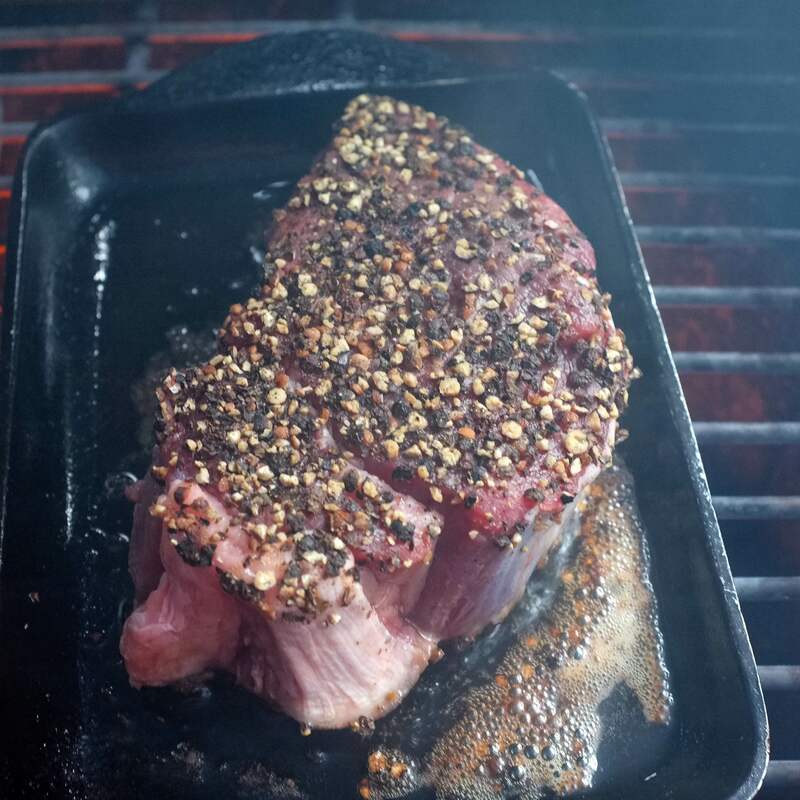 The peppercorns form a crust on the steak when cooked and provide a pungent but complementary counterpoint to the rich flavor of the high-quality beef. It won’t be quite as tender of a loin cut, but NY Strip would also be a suitable cut for you to use at home. As I typically already reverse sear steaks on a routine basis, this cook is a low degree of difficulty. It does, however, give me the opportunity to sear these steaks in the normal order and is dressed up a notch by the pan sauce. 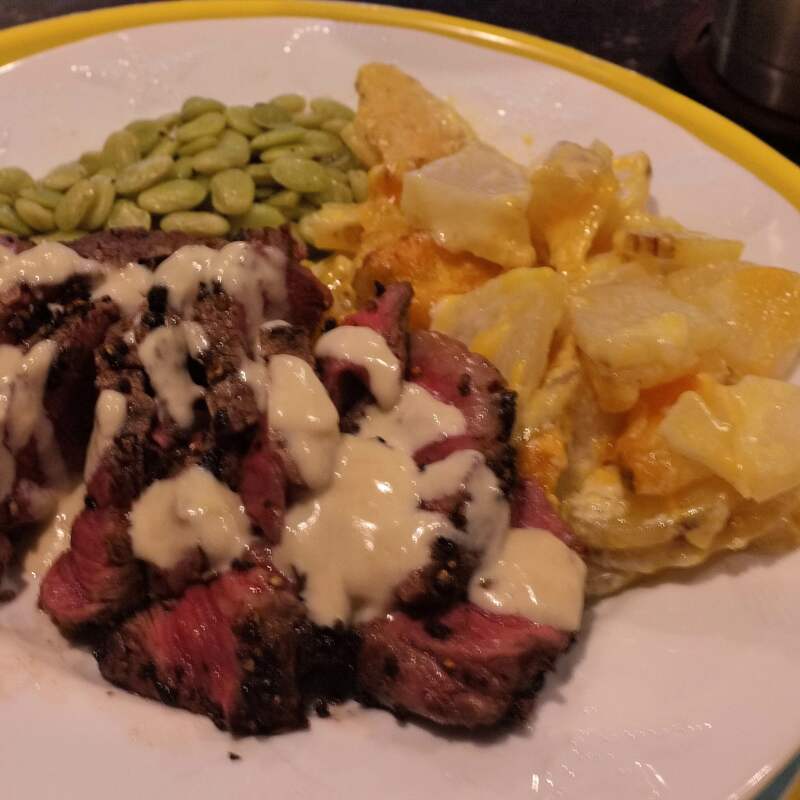 Tonight was also a team sport with Mrs. MagicCityBurn and she made her famous potatoes au gratin and farmers’ market lima beans to accompany the steak. If you wanted to stick with the French theme, lentils or haricot vert might also make excellent options for sides. 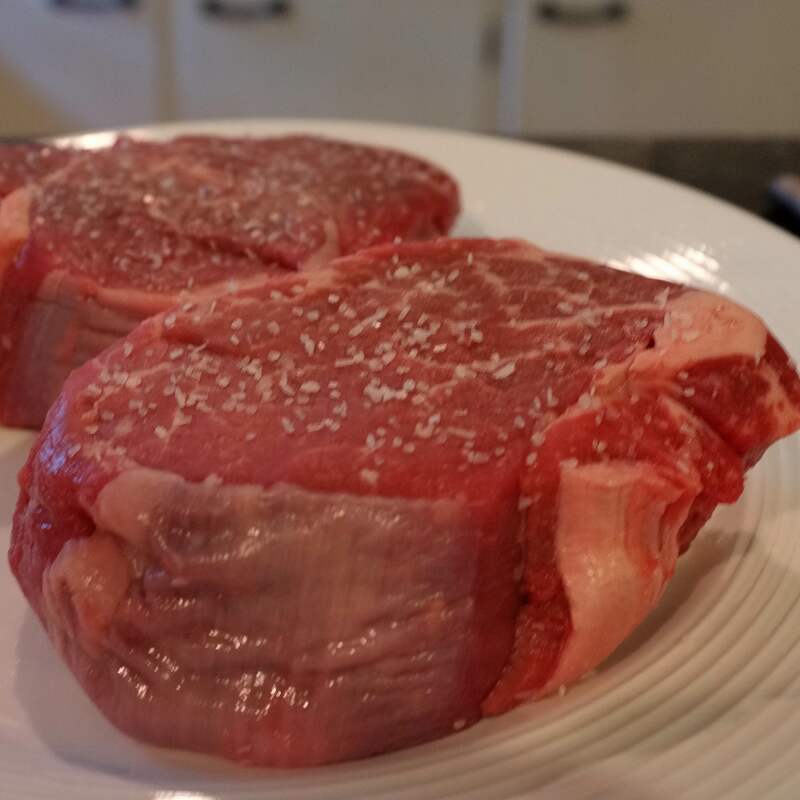 30 minutes beforehand, remove the steaks from the fridge and dry brine with kosher salt. Using a mortar and pestle, grind black peppercorns. Spread the black peppercorns on a plate and press the steak into the peppercorns, leaving a peppercorn crust on each side of each filet. Preheat a cast iron skillet the oven to 350F. Preheat the grill to 600F-700F. Sear the steaks for two minutes on each side. 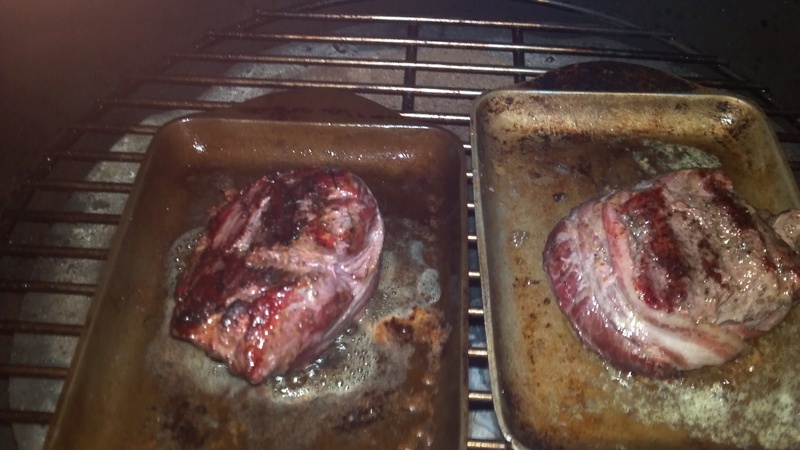 Remove the steaks from heat and transfer into the cast iron pan in the oven and cook to desired doneness. 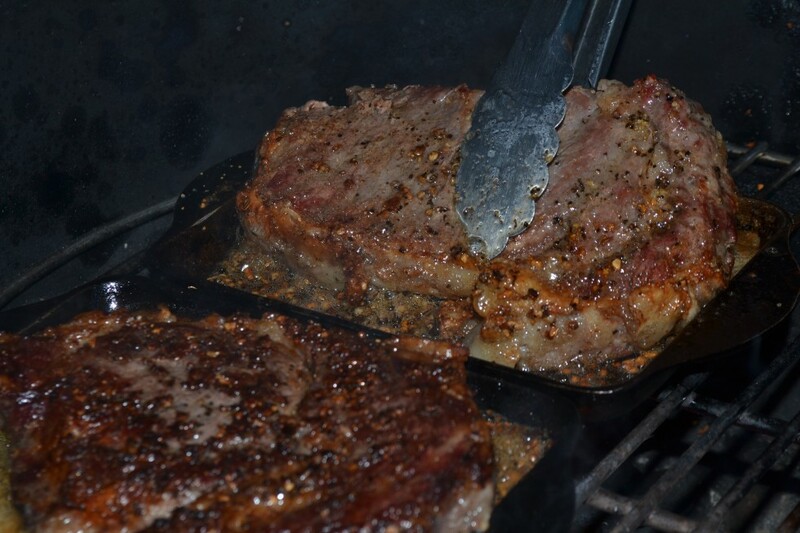 With steaks, you should be cooking to temperature and not for time. 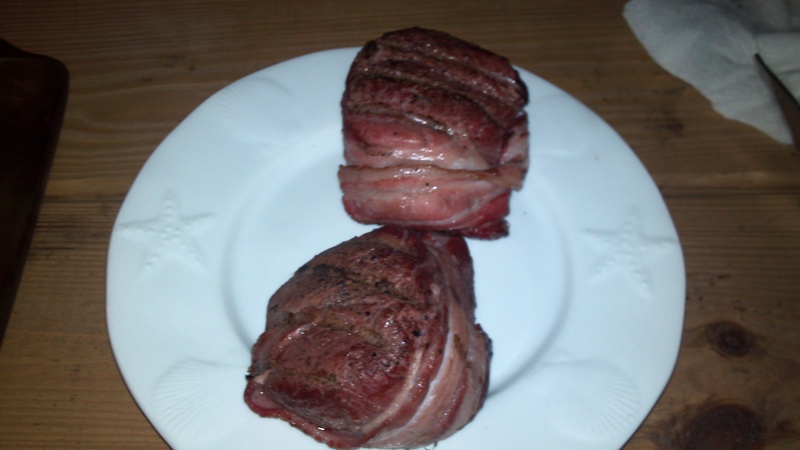 But, as a general rule, a 1" filet should take about 8-10 minutes to reach Medium Rare (135F). The same steak should take 12-15 minutes to reach Medium (145F). 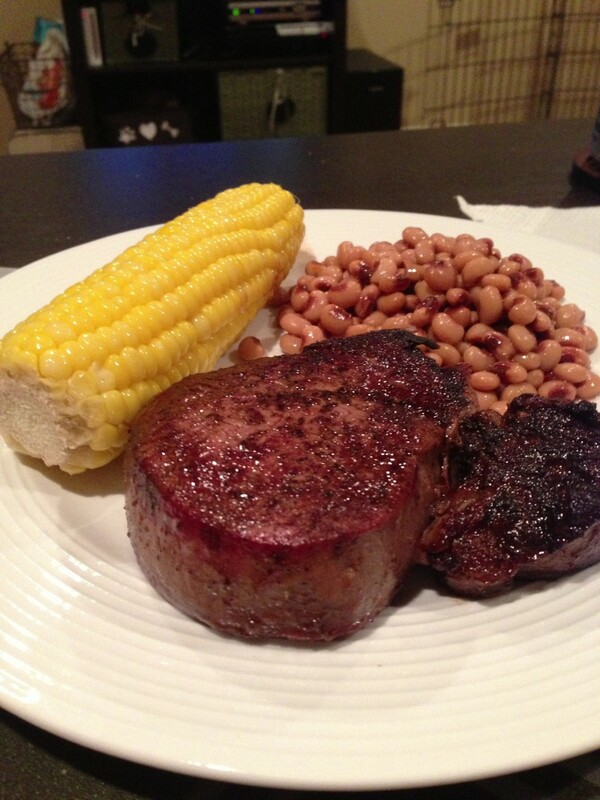 Remove the steaks from heat and transfer to a plate to rest. Over medium heat, in a pan, add 1/4 cup of cognac or liquor and ignite. Shake the pan until the fumes are extinguished. 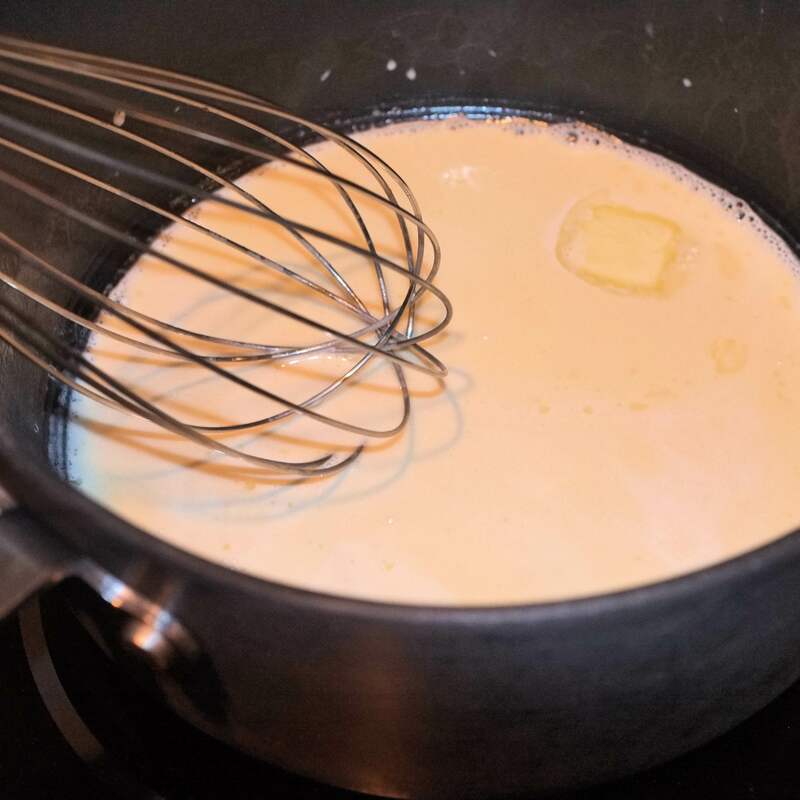 Add the heavy cream, whisk for 5 minutes or until the sauce thickens. Add 1 tbsp of unsalted butter and whisk in. Slice steak across the grain. Top sliced steak with pan sauce. This isn’t my first steak post. 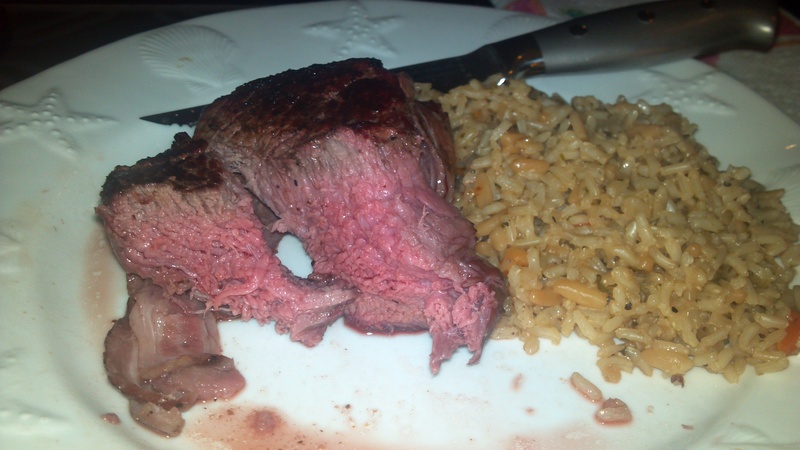 But it’s by far the best example I have of cooking steaks recently. And the photos are much better than my last steak cook. So I’ve been quiet for a while. Not for lack of cooking. Not for lack of taking photos of food. Just, not posting in a timely manner. Thanks to eatdrinkandbemanly.com for reminding me of my social responsibility. I also have numerous pics of his fajita recipes, which are excellent. 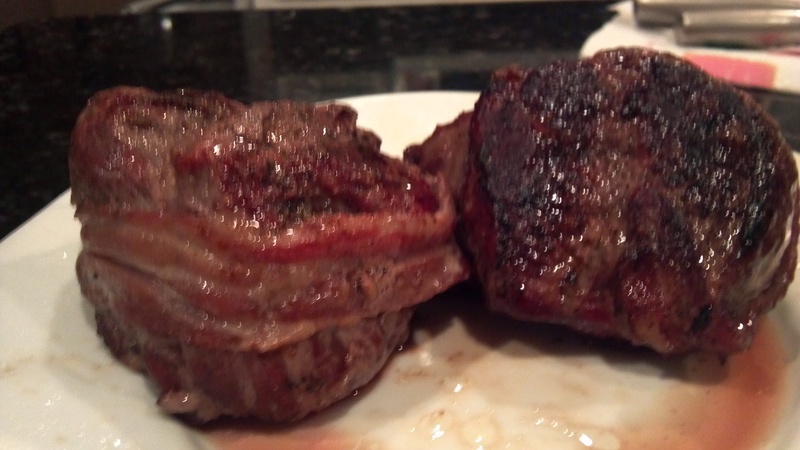 A couple weeks ago, we picked up some pretty thick (1.5+” thick) bacon wrapped filets at the grocery store. Given that I hadn’t cooked a thick steak in a while, I decided to go with a “less is more” recipe. This technique isn’t fast, but it does produce an excellent brown crust on the meat that you aren’t generally going to get outside of some pretty pricy steakhouses. 1. Remove the steaks from the fridge. 2. Blot dry with a paper towel. 3. Sprinkle salt liberally over the steaks. 4. Cover with another paper towel and let come to room temperature for an hour or so. 2. 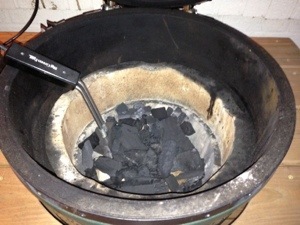 Start fire and preheat grill to a dome temperature of about 300F. 1. Add the steaks in the reverse order you want to pull them off. For medium rare, you’re looking to leave the meat on at this temperature for about half an hour. My wife likes her steaks closer to medium well, so hers was on for about an hour. 2. Remove steaks. Note the relative lack of grill marks. Sprinkle with some more salt. Crack fresh peppercorns over the surface of the meat. 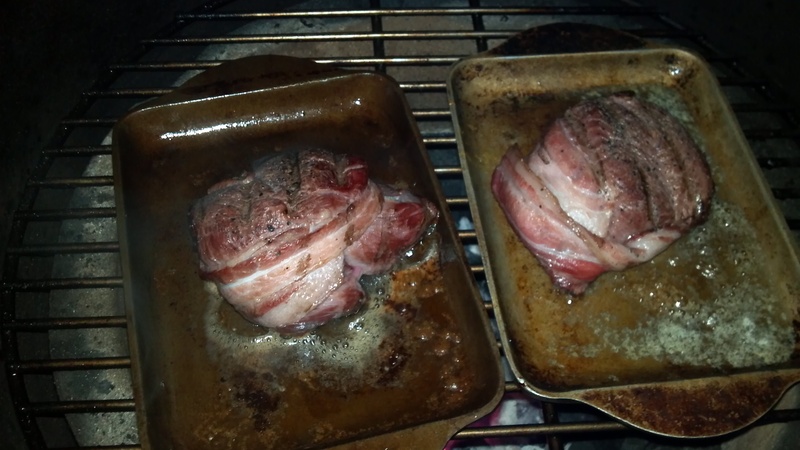 Place on a warm plate and wrap in foil. 3. Open up the vents on the grill and let it get hot. Like 600F+. 1. We have these amazing little cast iron grill plates that I received from the “Hall of Fame” in laws. I don’t know where they found them, but if you don’t have one, a small cast iron skillet is your best bet. 2. Cut up a couple Tbsp of regular, salted butter. 3. 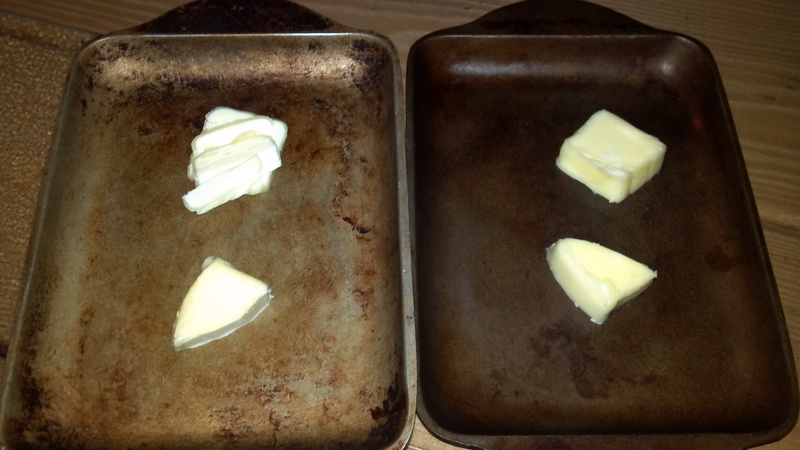 Put the plates on the grill and let the butter get hot and melty-sizzly. 1. Once the butter is melted and sizzling, put each filet down. Close the grill. 2. Wait 2 minutes and flip. Close grill again. 3. Wait two more minutes and remove from the grill. 4. Put them on a second, clean warm plate. Wrap in foil and let rest for 5 to 10 minutes before serving. 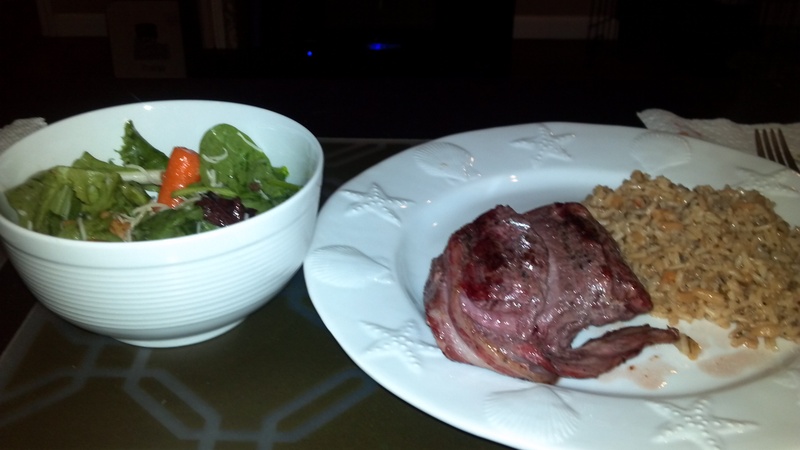 We ate these with a simple green salad and some organic brown rice pilaf from the rice cooker. Tonight’s recipe comes from PinkBites.com. 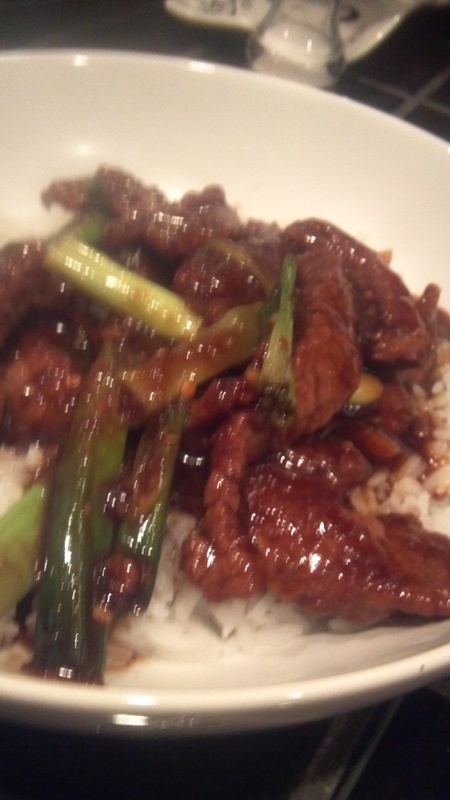 Thanks to Pinterest, I can now see other people’s pictures of foodporn and go and do likewise. So I figured I’d go ahead and give credit where credit is due. Thanks!! 1. Add 1 cup white rice. 2. Add 2 cups water. 3. Press the button to begin heating the rice. 4. Wait till water comes to a boil and begins to reduce down. 5. Keep an eye on it and stir as needed so that the rice doesn’t stick to the walls of the cooker. 1. Pat the steak slices dry and mix them with the corn starch. 2. Using your hands or a spoon, move them around to make sure all pieces are coated. 3. 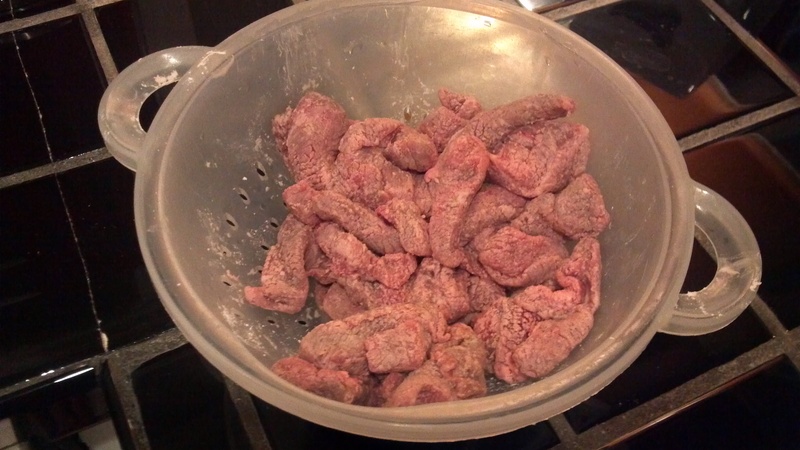 Place beef slices in a strainer and shake off excess corn starch. 1. Heat half of the oil in a large wok or saute pan at medium-high and add the garlic and ginger. 2. 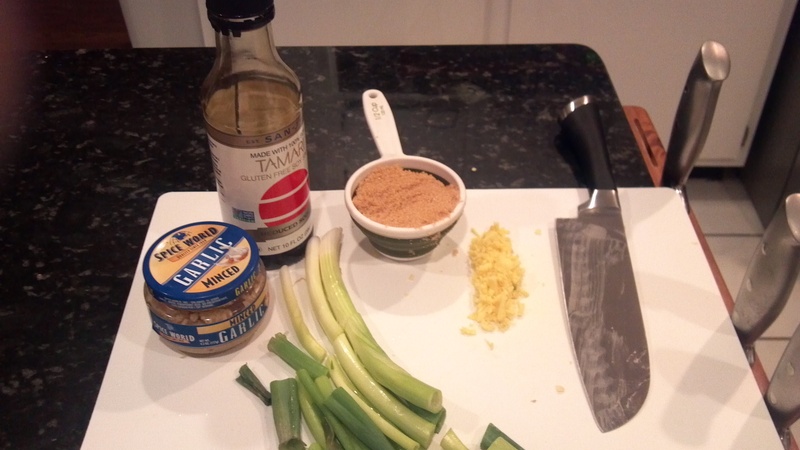 Immediately add the soy sauce, water, brown sugar and pepper flakes. 3. Cook the sauce for about 2 minutes and transfer to a bowl. Don’t worry if the sauce doesn’t look thick enough at this point. The corn starch in the beef will thicken it up later. 1. Turn the heat up and add the remaining oil to the wok. 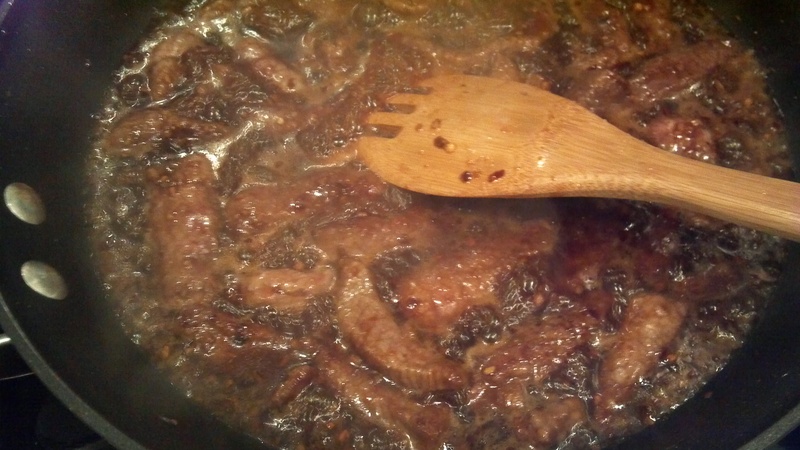 Add the beef and cook, stirring until it is all browned. 2. 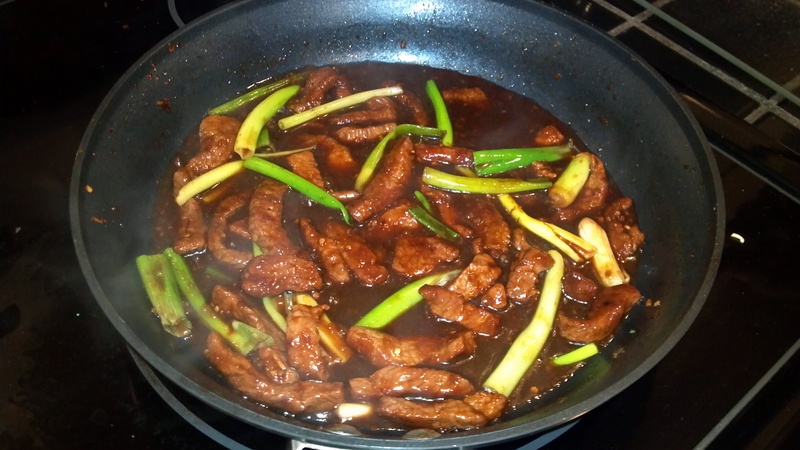 Pour the sauce back into the wok and let it cook along with the meat. 3. Add the green onions on the last minute so the green parts will stay green and the white parts crunchy. 4. Serve it hot with rice. I’ve smoked pork butts and ribs in the past. But , until recently, I’d always been a little intimidated by beef brisket. 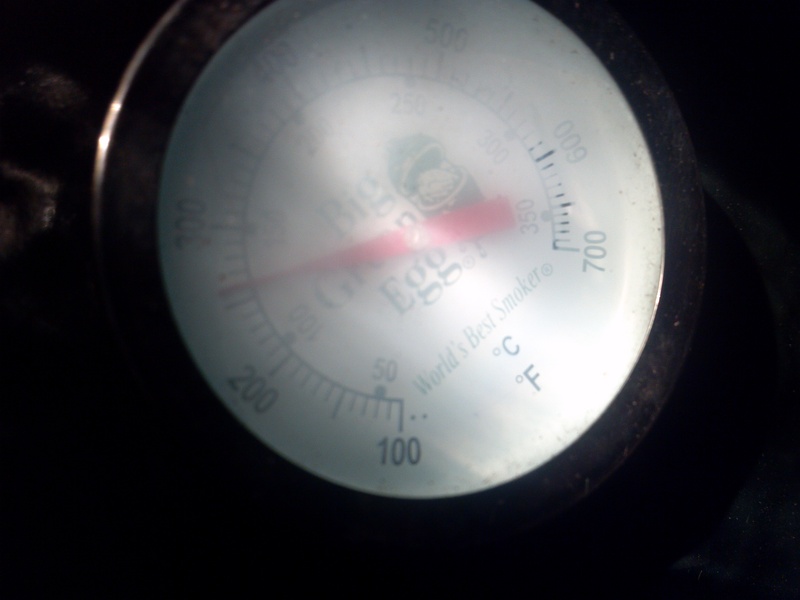 I never felt comfortable holding a consistent low temp for as long as needed for a brisket until I moved to the Big Green Egg. My old smoker was leaky and drafty. Ribs and butts are forgiving enough for that to be OK, but a brisket always seemed to be an expensive experiment until I got my Egg. This is my second brisket. I had to pull this one off early in the morning and keep it hot until lunch time on the Quad at the University of Alabama. The good news is, other than the platesetter, this recipe didn’t require any specific equipment other than a disposable drip pan and a pair of tongs. I did not use an accessory to maintain the temperature, nor did I use a wireless thermometer to monitor the fire. I did use a ($10) digital pen thermometer to check the internal temperature and make sure the meat was fork tender the next morning. I planned to document this process beforehand, regardless of the results and put this up. Luckily, it worked out pretty well. This post is intended to document a single brisket cook, not necessarily be a guide for how to cook a brisket every time. For one, I am still learning this cut of meat. 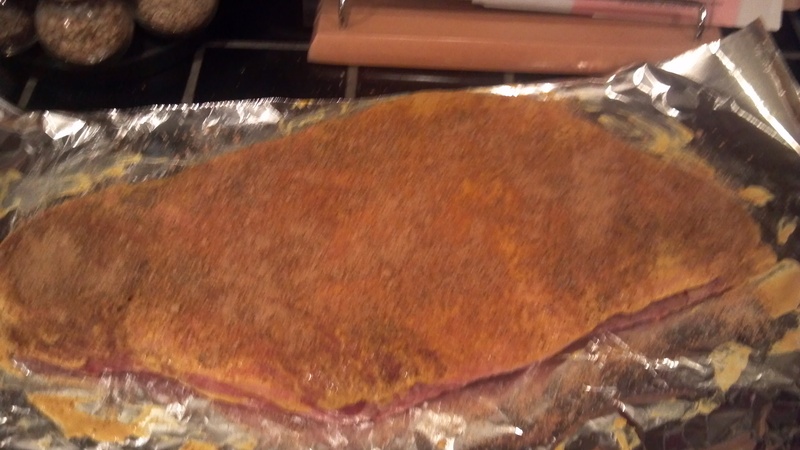 Also, cooking a 10 or 12 lb whole packer brisket (which I didn’t have for this cook) is going to take more time. Other than seasoning the meat to your liking, this is the most important step of this recipe. If your fire is not right, you run the risk of it either going out or burning too hot. 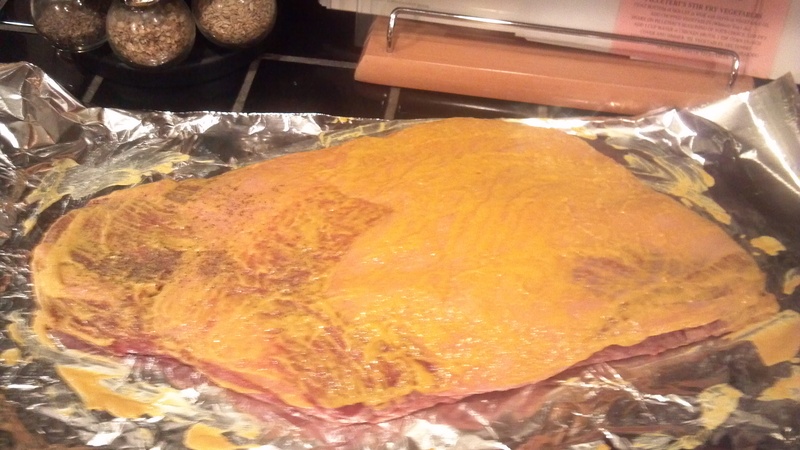 Brisket needs time to render the collagen before the meat will become tender. You’re looking to hit one of two pretty precise temperature ranges and keep the temp there for hours. 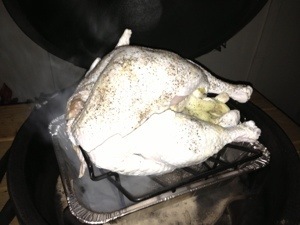 I aimed to keep the grate temperature at the high end of the lower temperature range of 225 – 250F. This meant keeping a dome temperature of about 270. 1. You need a lot of natural lump charcoal for this one. 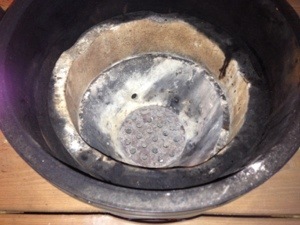 Rather than pouring coal into the firebowl, I hand placed individual coals around the electric starter. 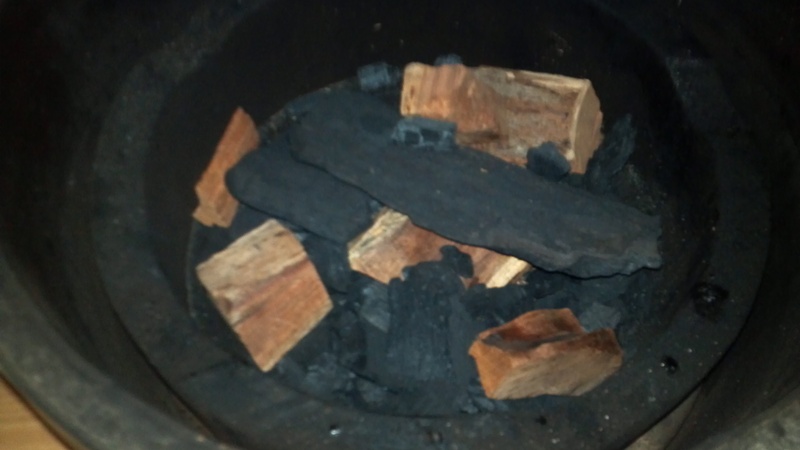 I also hand placed 5 or 6 chunks of mesquite for smoke. 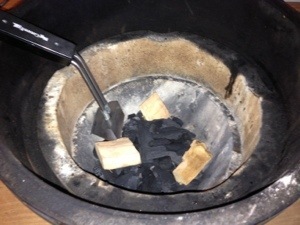 I filled the firebowl and then allowed coal and wood to spill over into the fire ring as well. This is going to be a fairly long cook and you don’t want to disassemble your hot grill to re-light. 2. Start the fire. I use an electric starter. 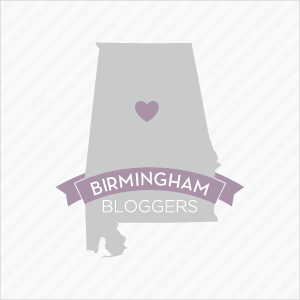 You want this to be a gentle and gradual fire. 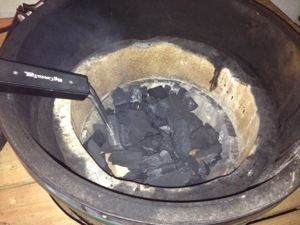 I left the electric starter in the grill for no more than 3 or 4 minutes. I opened the bottom vent completely and put the DMFT on, but rotated it open completely as well. 4. At about 240 degrees, I started to close down the vents. 5. Once the fire is stable and you’re close to your intended temperature, open the Egg and add the platesetter, inverted, for indirect heat. 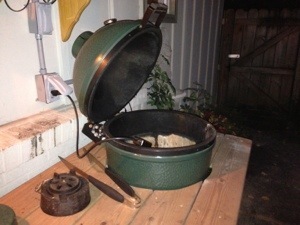 Put down a drip pan (a 13×9 pan is the perfect size for the Medium Egg and a 5 lb flat cut brisket. Add about an inch of water to the drip pan. Place the cooking grid on the platesetter feet, over the drip pan. 1. Remove the brisket from the packaging. Blot dry with a paper towel. 2. Trim away excess fat. Anything beyond 1/8 to 1/4″ is too much fat cap. The fat will help keep the meat moist, but you will lose some of your seasoning when you slice the meat if you don’t trim it some. 3. 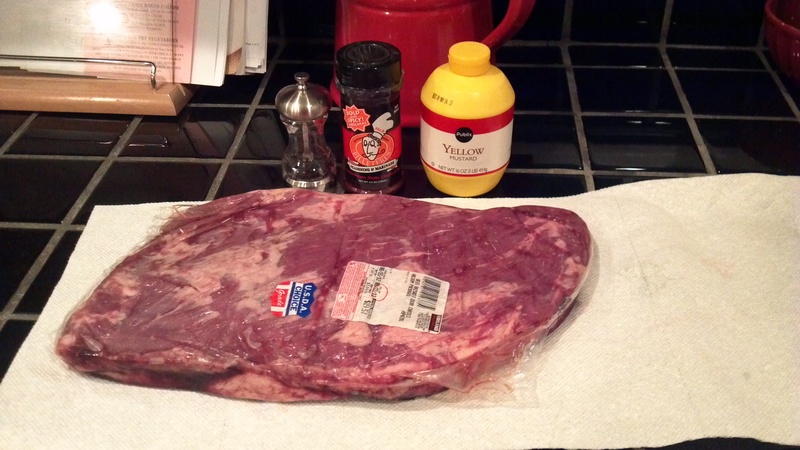 Place brisket, remaining flat cap up, on a sheet of aluminum foil and rub mustard over the surface of the meat. The mustard is the glue for your seasoning. It will cook off entirely and not leave a mustard flavor behind. 4. 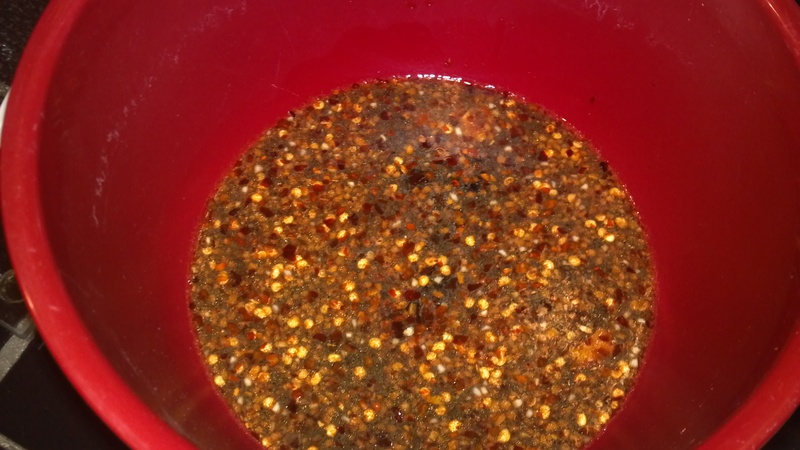 Crack black peppercorns across the mustard.I have a friend who uses black peppercorns almost exclusively as his rub. He literally crusts the brisket with black pepper. Regardless of whether you’re looking to use black pepper exclusively or a rub with other ingredients, you want to completely cover the mustard with seasoning. 5. Flip the brisket over. Apply mustard and rub liberally to the other side. 6. Cover in foil. Some people will tell you to let this sit overnight in the fridge. In this case, I wanted my Dad to see the entire process, so I did everything in a single session. 1. Open the Egg. Lay the brisket, fat cap down, across the cooking grid and over the drip pan. 2. Close the lid. Stay with the grill until it returns to your target temp. Check on it after about 30 minutes before you get comfortable enough to go to sleep. 3. Set a couple of alarms. I set one for 3:05 am and another for 5:30 am. I anticipated the meat to be ready after about 1.5 hours per lb. So I was looking for it to be finished between 5:30 and 6 am. 1. Leave the lid closed. 2. Check the thermometer. My dome temp had risen to about 290. Not a crisis, but warmer than I wanted it to be. 3. At that point, I decided to open the grill and flip the brisket. If the temp had stayed between 270 and 280, I would not have opened it and flipped it. I also made some minor vent adjustments. I knew the temp wouldn’t drop immediately, but over time, this would bring my temp back to normal. 4. Go back to sleep. 1. Fire is still burning. It returned to about 270 where I wanted it to be. 2. Insert digital thermometer. Different how-tos will tell you different target internal temps where your brisket will be fork tender (basically in a range from 185 to 205F). I was aiming to pull this somewhere around the 200F mark. At 5:34 am, it was at 204 and I was glad that I didn’t wait until 6 to get up and check it. 4. 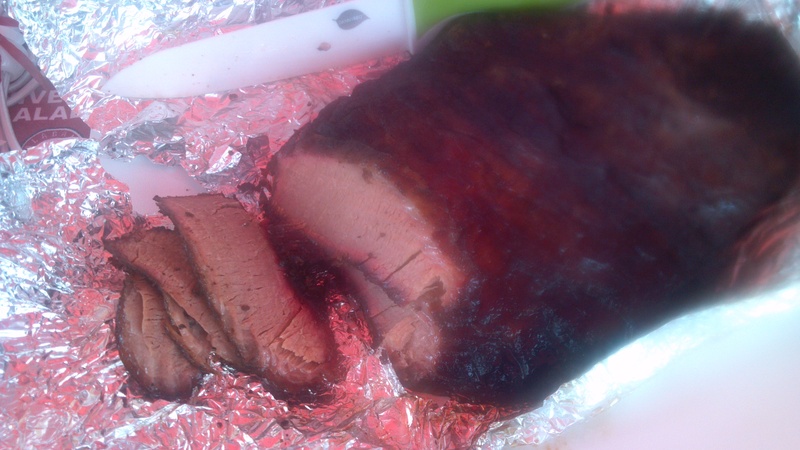 Pull the brisket, wrap tightly in the aluminum foil. Wrap warm towel around the foil. Put in a cooler. You want for the brisket to rest for no less than 1 hour before you slice it. I had to keep it warm for 5 and a half hours until lunch. 1. Crossed my fingers. Unzipped the cooler. Pulled the aluminum foil wrapped brisket from the towel. Still hot to the touch! 2. Unwrapped foil and sliced the flat, across the grain. 3. At this point, I’m probably dealing with about 3.5 lbs of meat. It fed about 10 of us pre-game lunch. And there was a little leftover after the game. None of it made the drive home. Roll Tide!